Holding a conversation with the enigmatic Jan Terri is sometimes like having a dozen tennis balls fired at you at once. Try to hit as many balls back as you can, and try not to get pummeled. No one ever knows what joke the ’90s Chicago underground cult icon is going to tell or what non sequitur she’ll use to bring up her dog, Denny, or the time she said she got hit by a semi truck on North Avenue, or that unreleased video she made where she got drunk and imitated Britney Spears doing the Coyote Ugly dance at Medusa club in the loop about a decade ago. What we do know is that the much-loved, sometimes maligned, viral video legend has made a bit of a comeback. Terri, a 1983 Columbia College grad from Franklin Park, made her way around the Chicago country and karaoke bars scene on her and her parents’ dime in the ’90s promoting her campy, country-rock albums Baby Blues and High Risk. She hustled her tunes to labels and dropped off press kits to any A&R rep she could find. Eventually, her nose-to-the-ground approach worked, and a press kit, which included a blue teddy bear to promote Baby Blues, landed in the hands of Marilyn Manson. He let her open for him at the Aragon Theatre in 1998, and she can be seen on his God Is In The TV collection. However, Terri is most known for her grainy, low-quality VHS videos on YouTube, which are chock full of unintentional comedy and irresistible charm. 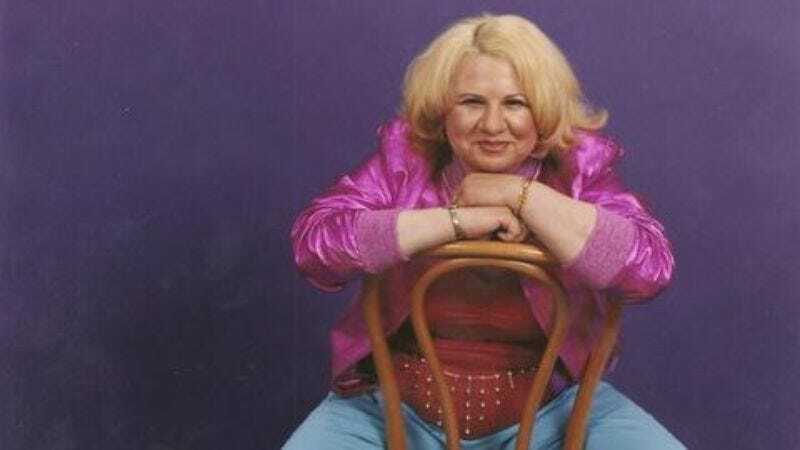 Terri has been relatively quiet since she stopped performing and recording music to take care of her mother from 2000 until she passed away in 2008. But thanks to YouTube, including the more than 1.5 million hits her video “Losing You” has received, she’s back to remind Chicago’s underground music followers of her bizarre and catchy tunes. She plans on releasing her third studio album, The Wild One, sometime this year as part of a documentary and book compilation made by her friend and former bass player, Darren Hacker. She also has a fourth studio album, No Rules No Boundaries, on the shelf in Nashville, ready to be mixed and mastered. Terri will première some of her new songs and take part in a question and answer session at the Nudge Gallery Friday, July 15 at 10 p.m. The A.V. Club: Why did you decide to make a comeback? AVC: Do you fund all your music? JT: Yeah, that’s what I did. That’s why I didn’t finish, because I was taking care of my mom. AVC: Your dad passed away, and your mom got sick in 2000, and you stayed with your mom for the rest of the time until she passed? JT: Yeah, my mom got kind of sick, and I was in a bad car accident in 2002. AVC: What was the accident? JT: I got hit by a semi. AVC: While you were driving? JT: I was standing still. I was in a stop position. I don’t even remember too much, because I was knocked out. I was in West Chicago; I was on North Avenue. That’s going to be in the book, so that’s why I’m not talking too much about that. AVC: You're keeping some things secret? AVC: What was that like, caring for your mom? JT: It was kind of rough, because she had a walker, then she had a wheelchair, but when she became bed-ridden, it got worse. It got bad near the end. She had dementia. She used to throw things, because she thought I was a mean person. Then, I’d come back a few minutes [later] and she’d go, “Jan, that mean person was here, but I fixed her.” She had plastic forks and spoons that she would stab people with. She thought the dog sometimes was my boyfriend or my husband, so she was really out of it. AVC: Were you making any music between the time your mom and dad died? JT: In 2000, I had to go down to Nashville to sing tracks for the fourth album. It just had to be mix and mastered. JT: You forgot the single, “Get Down Goblin” and “Rock And Roll Santa.” I wrote a children’s book for those two, but I don’t have any copy of it. The only copy is in Washington D.C.
AVC: I think “Get Down Goblin” would make a good theme song for a kid’s show. Did you write “Get Down Goblin” for kids? JT: No, I wrote it because the only major [Halloween] song that I remember was “Monster Mash,” and there wasn’t another one if you don’t count “Thriller,” which I don’t really count. There was not another Halloween song, and that’s why I wrote “Get Down Goblin.” That’s why I wrote [“Rock And Roll Santa”]. All the other artists were just redoing other songs. There weren’t any really cool Christmas songs out there when I was writing. AVC: What are the two children’s books about? JT: The one that goes with [“Get Down Goblin”] is about little goblins. The Christmas one goes just like the song, so I made it into story form. Eventually, I thought I’d make it into animation. AVC: What are the two books called? JT: One is the “Goblin Story,” and the other one is “Santa Story” or something. It’s under the holiday collection at the Library Of Congress. AVC: So you don’t have any copies yourself? JT: No, I gave it to somebody who was supposed to get me a publisher. So, he had mine and the same with some other stuff, and he committed suicide, so nobody knows where that stuff is. I have nothin’. He killed himself in 2006 or 2007. He was a friend, and he has a lot of book collections, so he was helping. AVC: Would you ever want to reprint them and try to sell them? JT: I’m not too worried about the books right now. AVC: Your career has been all self-made. You didn’t have a record label do it for you. JT: Nope. I own my own record label. And the publishing company, too. I tried to do the first album by myself in ’92. You look into Chicago showcases, you look into and check studios out and try to see which ones make you feel comfortable and which ones you can afford, and take it from there. AVC: Did you have anyone helping you? JT: Just my mom and my dad. Not too much my dad, more my mom. AVC: You were an only child. What memories do you have that stand out? JT: My mom took me to see The Beatles when they came into Chicago [at old Comiskey Park in 1965]. I remember they flew in on a helicopter and came in on the field and played. AVC: Who’s your favorite Beatle? JT: Paul… Paul McCartney… Sir Paul McCartney. I’ve liked him since I was 5 years old. I still listen to his music. I listened to the Beatles, Elvis, Chicago, Styx, Led Zeppelin, Aerosmith, Carpenters, Olivia Newton John. I liked Karen Carpenter, because she was a singer and a drummer. AVC: Do you play any instruments? JT: I play the drums. I’m okay—I haven’t played lately. I was the 1980 Illinois State Champ. AVC: In marching band or a rock band contest? JT: No, like regular type [of drums] you’d use in a group. It was the Illinois Music Association. They had nothing but drummers in different categories and different trophies. I don’t remember [what category]. I just remember I came in first. I had a snare, a bass, a tom, a high hat, and a cymbal. AVC: I heard you and your mom were in a PTA kitchen band where you played pots and pans. JT: My mom was heavily into PTA. They had kazoos, and my mom had a clarinet. How she made the clarinet was she would attach the kazoo to a roll of paper towels, and the roll of paper towels had a funnel at the other end, rolled up with aluminum foil. We put spoons for the key things and put coke bottle tops for the keys up top. JT: Yeah, mind you I was the youngest member. The lady that was playing the bass, which was a washtub thing with a pole and she just beat on it—boom boom boom. When she died, I started bringing in a couple of pieces of my drum, and I became the drummer. There was a girl who was a piano player, so she was the only real musician. Everyone else had kitchen instruments. AVC: What was the group called? JT: Ida Russell’s Kitchen Band. We played for schools. They played at other functions. Then, the money we saved at the end of the year, we’d go out or see a stage play or go out to dinner, and that was it. I was the youngest member. I must have been 19 or 20. The oldest one was 80-something. The others were 60s and 50s. They were all up there. AVC: Did that give you an itch to perform? JT: Oh, the itch was already there. At 5, you had “show and tell” at school. Well, my show and tell is I would bring in my Beatles wig and guitar, and I would sing one Beatles song and one Elvis song, and then, the teacher would take me to some of the other classes and I would perform for them. At the Beatles show, I got a Beatles guitar and wig there. I used to wear my Beatles wig. AVC: That’s funny. What songs would you sing? JT: “I Want To Hold Your Hand” and “I’m All Shook Up.” Why is that funny? AVC: An image of a 5-year-old kid doing that is cute. JT: Mind you this is before the Internet. If I would have done that today and somebody would have had a camera and stuck that in my face, I would have had a lot of hits now. AVC: You know what it’s like to get a lot of hits on the Internet. Does it surprise you the number of hits you got for “Losing You”? It has 1.5 million hits on YouTube. JT: Yeah, somebody told me that and that “Get Down Goblin’” has a lot of hits, too. I think that the Internet has helped the career more than doing it the old-fashioned way. AVC: Do you watch them online or read the comments? JT: I used to, but now I don’t. Some of the comments upset me when they say I look like Miss Piggy or Jabba The Hutt and have the worst music video. That’s fine for them, but I’m telling you, some of the ones that spend millions of dollars by the record companies, their videos ain’t that great, either. AVC: Why do you think people are drawn to your music and videos? JT: They make them feel good. I don’t know. I’ve had teenage kids tell me they’ve been getting cyberbullied and when they come home, they listen to my music and it helps them. The whole thing of being an artist is if one person likes your music, that’s what you’re there for. Not for the glory or all the money. You want people to listen to your stuff. AVC: Do you like your videos? JT: They’re okay, except for “Baby Blues.” I would never wear a white shirt again. It makes you look like 400 pounds. Everybody takes that one picture from “Losing You” and they freeze it and they place it all over the Internet, and that aggravates me. I can’t stand that picture. AVC: Who would you compare yourself to? JT: No one. [Laughs.] I would say Olivia Newton John. Some people say I remind them of Bette Midler. I really don’t know. AVC: Did you try and pitch your album to a lot of record companies in the ’90s? JT: Yeah. I went to RCA, Capitol, MCA, Mercury, Sony. All of them. AVC: What did they say? JT: Not too much… If you noticed, they’re not really doing so well themselves. AVC: Who shot your videos? JT: His name was Mike. He did that on the side because he was studying to be a doctor. I think I read in Chicago Reader that he shot people’s performances, and I asked him could he do this, and he said he’d try, so that’s how. He moved out to Las Vegas, and I don’t have any way to get in touch with him. He shot another video, but he never edited it. He’s got that tape. JT: It would be one on the No Rules No Boundaries. I was imitating Britney Spears. Mind you, this was before she had a drinking battle. I literally was drunk, so I was a drunken Britney, and I was doing that Coyote Ugly dance off the bar. AVC: You were pretending to be Britney drunk? JT: No, I wasn’t pretending. I was Britney drunk. I got drunk because Mike wanted to do something on [top of the bar] and I’m afraid of heights, so I asked [my friend] Miguel for a shot of tequila. He gave me a shot of tequila and that loosened me up, and then I asked my friend Sarah to do me a favor and ask Miguel for water. She misunderstood, and in the water glass was more tequila. So, when I drank it, I got totally blitzed. AVC: And then you shot a video? JT: Yeah. When Mike says, “Action,” I’m totally fine. The minute he says, “Cut,” I can’t walk. People have to help me up and down the stairs. I didn’t know who the heck they were. I had a breast reduction, and my one friend across the table said, “Do you remember you were lifting up your top and showing people?” And I said, “No.” I was like totally, totally gone. You’re not going to put that in there, are you? AVC: I think it’s a funny story. JT: So, you’re gonna put that in, that I was totally bombed as Britney? AVC: Well I guess if he has the video then we’ll never see it. JT: You never know. We might track it down sometime. [Laughs.] It’s hard to do that Coyote Ugly dancing on the bar. AVC: How many records do you think you’ve sold? JT: I don’t know. I just know that somebody had Baby Blues on eBay and sold it for 60 bucks, and somebody sold High Risk for $500, which I think is totally nutso. I think it’s totally nutso. Maybe that’s because they thought I was dead. AVC: There was a rumor that you were dead, right? JT: I died in 2002, according to Wikipedia, of cervical cancer. I had five husbands and the last one was stealing my music. The question is, who were my husbands? Was one of them Marilyn Manson? I have no idea. AVC: Speaking of Marilyn Manson, what is he like as a person? JT: He’s very nice. He’s a nice guy. He treated me nicely. I have no problem with him. AVC: Why did he say he liked your music? JT: I don’t know. He and [his former girlfriend] Rose McGowan liked my music, so they flew me out. He had a surprise birthday party for Rose and I was the act for her birthday party. AVC: Why do you think people like your music? JT: I think they like the catchy type choruses that stick in your head. The Beatles were simple writing. Elvis was simple writing. I don’t consider myself a complex songwriter. But “Love Me Do,” “I Want To Hold Your Hand,” and “Let It Be,” they were simple-type songs. People could sing them, and they stuck in your head. AVC: Where does your entertainment side come from? JT: Probably my grandfather. He used to hang out in Tin Pan Alley in New York. AVC: And your dad, who was a lightweight boxer, did entertainment on the side. Didn’t he call himself the Black Elvis? JT: Well, it wasn’t exactly the Black Elvis. I let him do some shows with me. He had an Elvis costume and sometimes he’d be Elvis, or he would sometimes put black face on and be Sammy Davis Jr.
JT: So, not quite Black Elvis? AVC: No. When the band would play [in the early ’90s], we would time it [between costume changes]. They would jam for two or three minutes. We kept the show going. You’ve got Cher and all those big acts, and I’m just a little act and in between songs, I’m trying to do comedian acts and keep the ball going to entertain. Don’t give them a dead space; just keep it moving. My dad could do a couple of songs while I was getting my “Journey To Mars” outfit on, which was usually the closer. AVC: Did the audience like it? JT: Oh yeah, especially when you throw out Milky Way candy [during “Journey To Mars”] and they threw it back at you. They only have Mars Bars on Halloween. If you’re doing shows all year round, I’d have to get the Milky Ways. You can get the Mars, but you have to order like one semi full. That’s a lot of candy. So, it was cheaper to get a couple of bags of Milky Ways. Manson always used to say that I needed to work on my pitching arm, because [the candy] wouldn’t go very far. AVC: Did people like your dad entertaining? JT: Some of the fans liked him. I didn’t really care, because I had to keep the show moving and do something. AVC: Did your mom like all this? JT: She was very supportive. We were real close. I was very close to her. AVC: Did you do any writing when you were taking care of your mom? JT: No. I just wrote something a few weeks ago for the first time, “I’m The One.” It’s a love song. AVC: So, you’re not necessarily completely retired? JT: I’m still retired. I’m ancient. JT: I’m 450 years old. And I used to be 5’9”, and I lost my height in a slot machine in Las Vegas. AVC: In a slot machine in Las Vegas? JT: You know you’re a redneck when your trailer mobile home becomes a houseboat. AVC: When your trailer mobile home becomes a houseboat? JT: Okay, you never listened to Jeff Foxworthy when he used to do “You know you’re a redneck”? JT: Okay, well, you know you’re a redneck when your trailer home becomes a houseboat. It becomes a boat. AVC: What do you think about watching your videos now? Is it fun to look back at them? JT: Some of the stuff is basic. It’s just some of the clothes I was wearing, it’s like, eh. I don’t like watching myself, because I think why did I do that, why did I wear that, why did I have my hair like that? I get too critical. I don’t listen to myself unless I need to practice or something. I usually don’t like listening to myself. AVC: Why so hard on yourself? JT: I’ve always been like that. Creative people are really hard on themselves, because they want stuff to be perfect. They want stuff to be right. A lot of artists are hard on themselves. It’s just part of the territory.